Metallic Pigments Market size is set to surpass USD 2.3 billion by 2024; according to a new research report by Global Market Insights, Inc. Growing demand from decorative paints & coatings industry owing to thriving automotive OEM and refinish industry may increase metallic pigment market demand. These products impart an elegant appearance, silvery metallic finish, and degradation resistance which increases their suitability for wheel coatings, interior coatings, other parts and accessories thereby promoting metallic pigments market growth. 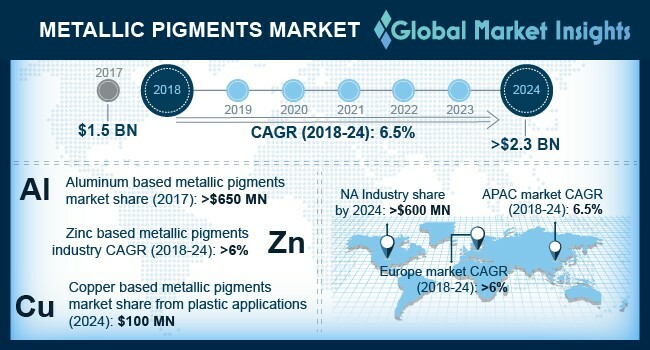 Stainless steel based metallic pigments market size from paints & coatings applications may register gains at over 5.5% by 2024 owing to ultraviolet, abrasion & corrosion resistance, hardness and high strength properties. These products are incorporated in conventional water and solvent-based protective coatings and applied on metal substrates for enhanced protection. Moreover, these products form a multilayered structure tightly bonded to the substrate which exposes the flake particles despite loss of the coating binder, thus offering sustained protection and influencing the market revenue. North America driven by the U.S., Canada and Mexico nickel-based metallic pigments market size may witness consumption at over 2.4 kilo tons up to 2024. These products provide several benefits such as versatility, high corrosion resistance, electrical conductivity, ferromagnetism and attractive appearance. These products have various applications including decorative coatings and electrically-conductive coatings for aerospace & military applications, and wall shields. Germany aluminum based metallic pigments market demand from printing ink applications may witness gains at over 5.5% by 2024. Beneficial product features such as enhanced flake geometry, solvent-free product forms, tighter particle distribution and improved adhesion may stimulate market growth. These products are suitable for various printing applications such as gravure printing, screen printing, flexography, offset printing and thermal transfer printing which is expected to boost overall market size. China copper based metallic pigments market size is expected to surpass USD 90 million over the forecast timeframe. The presence of major manufacturing base, booming plastics & printing inks sector, and favorable regulations may boost market growth in the region. These products exhibit a unique metallic-bronze and gold visual effect which increases product suitability for coating and decorative ink applications for metal substrates. Moreover, copper-based products are available at lower costs, provides malleability, corrosion resistance, and specific gravity which may increase stimulate product demand. Sun Chemical Corporation, BASF SE, Altana, Silberline Manufacturing, Carl Schlenk and Toyo Aluminium are some of the prominent industry participants in the market. Companies are highly engaged in forming collaboration to expand their regional reach along with heavy investments in R&D activities to develop new products and expand their product portfolio.